Current Therapy in Medicine of Australian Mammals provides an update on Australian mammal medicine. 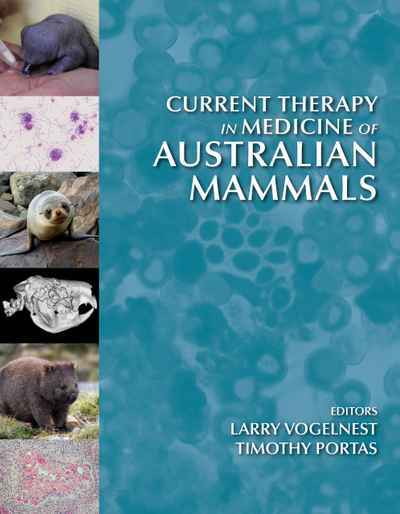 Although much of the companion volume, Medicine of Australian Mammals, is still relevant and current, there have been significant advances in Australian mammal medicine and surgery since its publication in 2008. The two texts together remain the most comprehensive source of information available in this field. This volume is divided into two sections. The first includes comprehensive chapters on general topics and topics relevant to multiple taxa. Several new topics are presented including: wildlife health in Australia and the important role veterinarians play in Australia’s biosecurity systems; medical aspects of native mammal reintroductions and translocations; disease risk analysis; wildlife rehabilitation practices in Australia with an emphasis on welfare of animals undergoing rehabilitation; management of overabundant populations; immunology; and stress physiology. The second section provides updates on current knowledge relevant to specific taxa. Several appendices provide useful reference data and information on clinical reference ranges, recommended venipuncture sites, chemical restraint agent doses and regimens, a drug formulary and dental charts.